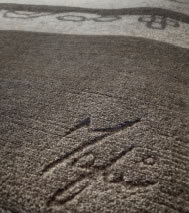 Rugs carrying the Mafi Signature are created to be the heirlooms of tomorrow while meeting the timeless living of today’s lifestyle. Each rug is handpicked to ensure excellence in design, yarn quality, dye selection and knotting technique. To give the traditional art of rug weaving a modern approach. To present the artistic value of a rug, while appreciating the legacy of the its artisans from around the world. “When you own a rug sealed with the Mafi Signature, the beauty and quality of the finished piece is evident in every strand of yarn, drop of dye and individual knot. In addition to being hand knotted of the finest Himalayan wools and natural silks, our meticulous care carries over into the conditioning process with our industry exclusive Masala Wash. The unique feel and soft textures of the Mafi Signature 16 collection is now mainly attributed to the wild herbs growing in the exotic regions in the Far East. Our Masala wash is a complex blend of some of these plants, such as lavender, aloe vera and aloo. According to folk wisdom, lavender has many uses. Lavender oil soothes headaches, and in pillows, lavender seeds and flowers aid sleep and relaxation. Not only does the use of lavender provide a mild and pleasant scent, but it also acts as a pet repellant deterring them from relieving themselves on the rug. Numerous scientific researchers have been published on the effects of aloe vera. The three main categories of research include the anti-inflammatory, anti- bacterial and anti-viral actions of aloe vera. In the Marsala Wash, aloe vera is the key ingredient to provide a softer texture, as well as a controlling agent to keep the bacterial growth and shedding to a minimum. “Rug weaving is a melody of artistic skills and craftsmanship passed through the generations. One can fully appreciate a rug when one admires the heart of the artisans behind it.